Pl ease find attached information on this year's Summer Lunch on Friday 13th May in the Ardilaun Hotel. For the last two years we have had very large numbers attend the Summer Lunch, which of course we are delighted with. 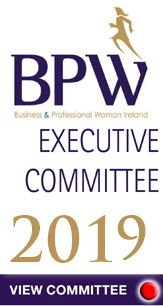 We are a very small committee running the event voluntarily and I am sure, as members, you will understand that for the event to go smoothly on the day we need to have all tickets paid for in advance so that table plans and the day itself runs well. Therefore, this year there will be no ticket desk available on the day all tickets must be paid for and collected in advance of the event. When booking via eventbrite please ensure you print out and bring your e-ticket(s) with you on the day. Thank you so much in advance, for your co-operation with this new new set up, we really appreciate it. The payment options this year are outlined below . 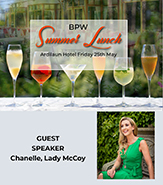 BPW Galway is delighted to present their Annual Summer Lunch which will take place in The Ardilaun Hotel, on Friday May 13th. 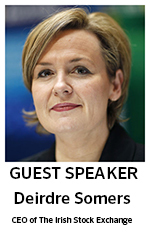 This year’s guest speaker is Deirdre Somers, CEO of The Irish Stock Exchange who was appointed to the role in June 2007. During her tenure the ISE modernised its structure, expanded its services domestically and internationally, rising to #1 stock exchange globally in fixed income and funds listings. The ISE was awarded Best Place to Work in Ireland this year. She is currently President of the Federation of European Securities Exchanges. With a keen interest in the importance of the role of markets as a relevant and accessible funding source for companies, particularly for high potential SMEs she is sure to bring a wealth of knowledge and insight for our guests on the day. 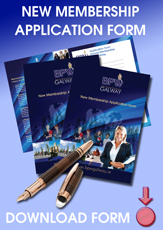 The hugely popular annual networking event is expected to sell out well in advance. The day will commence with a Prosecco reception at 12 noon, followed by a 4-course sumptuous lunch with wine. A raffle in aid of Enable Ireland Galway promises some fabulous prizes with entertainment from the Guinness Jazz Band provided well into the afternoon for guests of the event. 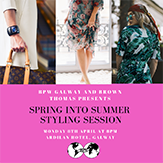 Tickets are priced at Members €50 Non Members €60 and can be purchased online HERE or by emailing bpwgalwaysecretary@hotmail.com to request a booking form. Please note that all tickets must be paid for in advance, no ticket collection will be available on the day of the event. No exceptions. 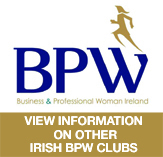 BPW Summer Lunch Committee .